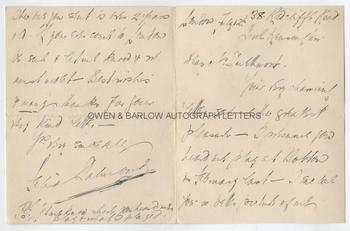 FELIX SALMOND autograph letter Signed. ALS. 2pp. 38 Radcliffe Road, South Kensington, London. February 12th 1938. To Mr [Granville] Smithurst. "Your very charming letter gives me the greatest pleasure. I . . . you heard me play at Bolton in February last. I enclose you a better picture of me - the one you sent was over 2 years old. If you ever come to London be sure and let me know and we must meet. Best wishes and many thanks for your very kind letter. Yours very sincerely, Felix Salmond. P.S. I don't know where you heard me play and what I played." 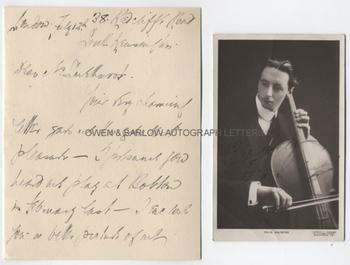 The photograph enclosed with the letter is a real photograph post-card by Florence C. Vandamm, Westminster, signed "Yours sincerely Felix Salmond". It shows Felix Salmond, half-length, playing the cello. The letter is 8vo bifolium. Approx 6.5 x 5 inches (16.5 x 12.5 cms). Some mounting residue to blank verso, else fine. The post-card photograph measures approx 5.5 x 3.5 inches (14 x 9 cms) and is in fine condition. 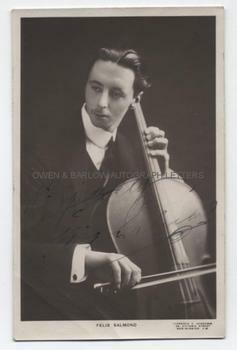 Felix Salmond came from a gifted musical family (his mother studied piano under Clara Schumann and his father was a fine baritone singer) and he quickly built a reputation as one of the best cellists of his generation. He was particularly admired by Edward Elgar who entrusted Felix Salmond with several premieres of his works, including his Cello Concerto in E Minor. Felix Salmond set the standard for this, one of the most loved of all works written for this instrument.